2. Post it on your blog or other public gallery (Splitcoaststampers, Paper Craft Planet, Stampin' Addicts, etc.) 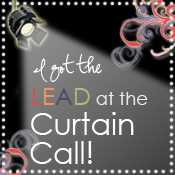 using the keywords Curtain Call 57 and make sure to include a link back here to the challenge. Please note the deadline will be Friday night. 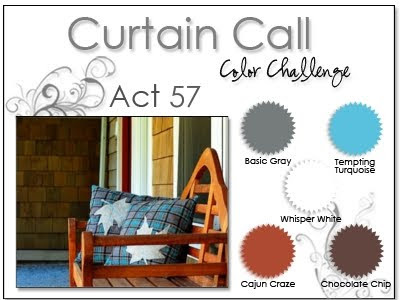 You have until Friday, November 26th before midnight (CST) to enter your Curtain Call Color Challenge: Act 57 project. 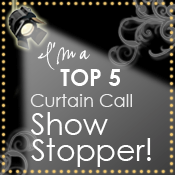 Join us for the Curtain Call Color Challenge: Act 57 and you could be one of the next Show Stoppers! We have two awards up for grabs! Those chosen as "The Lead" and "Top 5" will receive an award to post on their blog(s) and share the exciting news! 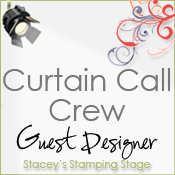 ...then play along with us and post your Curtain Call Color Challenge: Act 57 creation using Mr. Linky back here at Stacey's Stamping Stage. I wasn't sure about these colors, but your card is GORGEOUS!! An inspiration for sure. I can't believe 43 people have already finished the challenge! I hope to have some extra time to work it in this week...Happy Thanksgiving!! Gorgeous card this week, Stacey! I adore this gratitude set, and it is perfect for these colors. The distressing and scallops are fabulous! This is really pretty Stacey! I love your card! I love the challenge and your card! I love how my card turned out too :) Hope you all can go to my blog, have a look around and leave a comment! I bookmarked you site, plan to come back to have a good look around! eeeekkkkk, this is gorgeous...I luv it! These were great colors to get a masculine card done for my stash! Beautiful sample cards! Hoping my card fits the bill!!! I was thrilled with these colors. They gave me inspiration for the birthday card that I had to get done today. Thank you for sharing your creativity and eye for color. LOVE the colors this week and LOVE your card, Stacey! Stacey these colors are absolutely gor-juss! And your card is stunning. I hope to have time to play along this week--it's been way too long! Fun Colors. I had fun with this one. Thanks for the opportunity. But once I pulled the colors together, it was fun!!! Beautiful colour combo, Stacey. Your card is fantastic; I especially like the distressed panel,and the partly-hidden stamped image. AWESOME colors and great sample, thanks sooo much!! Playing along with a past challenge - http://runningwscissorsstamper.blogspot.com/2010/12/teenage-masculine-card.html.